Samsung Pay vs Google Pay, Where's Your Money? Online Music Store Samsung Pay vs Google Pay, Where’s Your Money? Digital wallet wars are the hottest right now,and it is only getting tougher. Different companies have come up with mobile payment systems that are going to handle all your cards making it simple for you. All these companies want to handle all your mobile payments and it is hard to make a decision which one is the best. If you have a Samsung smartphone in the US and you are that kind of a person who keeps all your apps updated, chances are you now have two new apps on your phone, Google Pay and Samsung Pay. The two are mobile payment systems with Google Pay being the last entry in the digital wallets world. If you have a Samsung phone, these two apps aim to do the same thing and that is handling your mobile payments. These two apps might have the same aim,but they are not the same in the way they intend to achieve this. Let’s take a look at these two apps and explain the differences between them to see which one best suits you. Like said before, both the Samsung Pay and Google Pay apps are both available on the newer Samsung smartphones. Samsung mobile phone run on Android OS and this is the reason why both the apps are compatible with the Samsung phone. However, the case is different from other Android smartphones. Samsung Pay is not compatible with other Android smartphones as it was purely made for Samsung smartphones. Compatibility also applies to the older Samsung phones as, during it’s launch, Samsung did not talk about backward compatibility though they are working on it. The newer Samsung smartphones like the Galaxy S6 will come with Samsung Pay, but the other models might need an upgrade to accept the app. The newer Samsung smartphones come with a fingerprint scanner which is one of the significant differences between these two apps. With Google Pay, you have to unlock your phone and enter a PIN for a transaction to be completed successfully. This is one reason why people think the app is cumbersome as compared to Samsung Pay, where you only have to place your finger on the fingerprint scanner and the transaction is completed. It is easy and hustles free. The real security in Samsung Pay is the Secure Element on the Galaxy S6. Not a lot is known about it apart from the fact that it is supplied by a German manufacturer Infineon. Based on several reports, the chips are built with hardware-based security mechanisms, but the details have been unclear. With Google Pay, security involves adding your card to their secure servers and adding a virtual card to your device. When paying, the vendor does not see your card let alone have access to it. Google, however, tracks your transactions and stores this information on their servers. 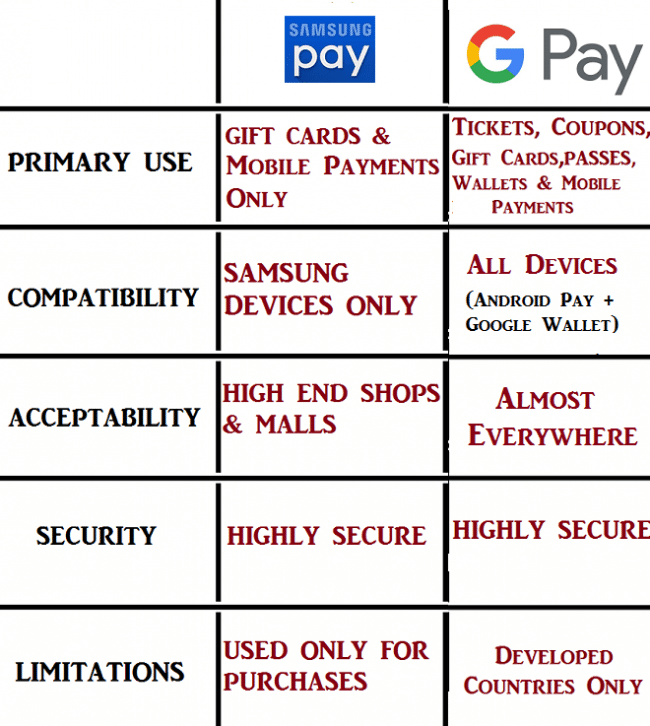 Both Samsung Pay and Google Pay use Near Field Communication (NFC) technology. However, Samsung has a trick up on its sleeve and it is the technology called Magnetic Secure Transmission (MST) and Google pay doesn’t have this. The MST technology lets your Samsung phone emulate an actual card swipe and this is an advantage since it can work at any payment terminal where you can swipe a card. Instead of physically swiping the card, you just activate Samsung Pay on your phone and authenticate it with your fingerprint or PIN then hold the phone over where you usually swipe your card. MST technology makes the terminal react like you have swiped a card through and process the payment. This means you can use Samsung pay in a store that doesn’t support NFC technology as opposed to Google Pay which can only be used in an NFC enabled terminal. Google Pay was launched earlier this year,but this doesn’t mean it doesn’t have a lot of users. It combines both Android Pay and Google Wallet which were used on Android OS before its launch. This means the users of android pay just have to update their app on Play Store. Samsung Pay, on the other hand, is compatible with the newer Samsung phones starting from Galaxy S6. But it is also a preferred mobile payment system for most of it’s customers. It has a lot of users due to its ease of use and support for payment terminals that use MST technology. It is accepted at many stores as compared to Google Pay,and it can also be installed aside Google Play on a Samsung smartphone. If you have both of these apps on your phone, your transactions can be limitless starting from in-app purchases to website or online purchases. These two apps deliver similar services but their differences are what makes each of them unique. And these differences are what makes the consumer have an easier time choosing the best one.